Grabbed this one while I was in Colorado a while back and decided this was the night to crack into it. It's part of Epic's Elevation Series. Each release of each of the four Elevation beers is completely unique- which is why the website provides a summary of 36 (as of today) individual Hopulent releases. That's pretty impressive attention to detail. I suppose if you were really on the ball you could have a hell of a vertical tasting on your hands. The Hopulent in question here is part of release #24. My first impression is that I have another not-my-favorite malty IPA on my hands, but I will dutifully try not to presume too much. This one smells very caramelly, similar to the SweetWater 420, though with a lot more citrus. And the malt part of the flavor is mostly caramel as well, but the hops just stampede right over top of it. 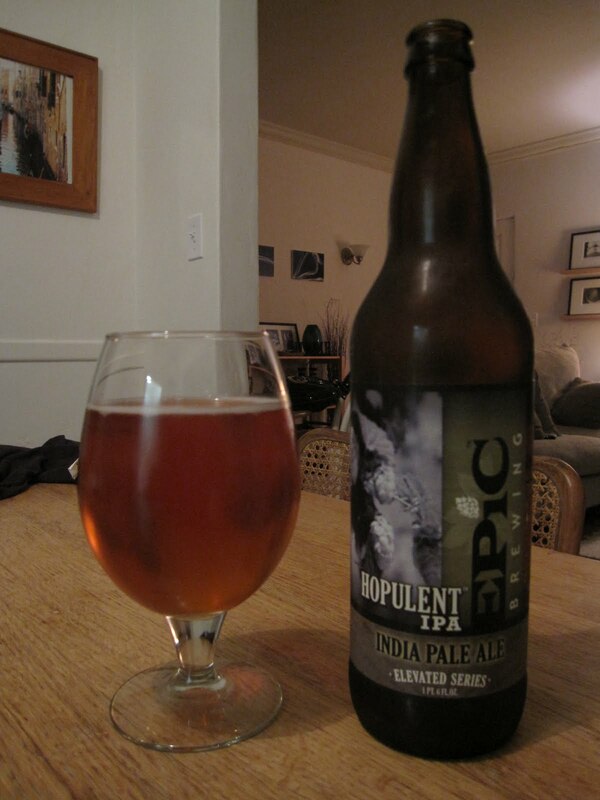 The malt leaves just enough sweetness and body to provide a counterpoint the powerful hopulence (I think I like that term, and I hope Epic doesn't take umbrage if I use it in the future), and in the end- it's pretty damn good. It's not West Coast, it's not East Coast, it sort of treads a line right down the middle (a flyover IPA?). Between this and the Squatters' Hop Rising, Utah's got some interesting IPA action happening. Whoda thunk it?